Indiana Jones: The Complete Adventures on Blu-ray, hits the streets today. The box set includes all four of the franchise’s humorous, action-packed films, including Raiders of the Lost Ark, Temple of Doom, Last Crusade, and Kingdom of the Crystal Skull. In any format, these films are pure Saturday matinee at the movies fun. Now, according to the folks at Industrial Light & Magic, they are even better. The company says they have painstakingly reviewed every second of film in order to clean up the picture quality, which is essential for Blu-ray. Then, they enhanced the audio to take advantage of the capabilities of many modern systems. Indiana Jones is a cult classic. It doesn’t need fancy effects and modern technology to make it better. It stands tall just as it is. As if the revitalized films weren’t enough, LucasFilm has packed in seven hours of bonus features including a brand new documentary. “On Set with Raiders of the Lost Ark (From Jungle to Desert and From Adventure to Legend)” includes behind the scenes interviews with Steven Spielberg, George Lucas and Harrison Ford that have rarely been seen before. Other featurettes include a “making of” documentary on each of the films, a closer look at the stunts and the music, iconic props, a look at the famous melting faces effect and so much more. There are also original Blu-ray pop-ups to go along with several of the Crystal Skull features. 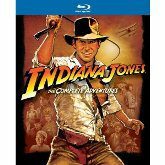 Indiana Jones: The Complete Collection on Blu-ray is available right now on Amazon and other major retailers. Bull whip, not included.